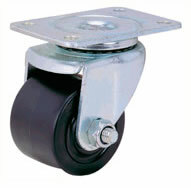 Business machine casters feature a zinc plated top plate and yoke (black painted finish also available), along with a ball bearing raceway for easy movement. They provide excellent mobility and floor protection, designed for office and business equipment, pianos and other heavy units. Brake options are available. Call 1-888-904-9531 for additional information and ordering. Hard Rubber 580 NCC-04S2520-HRS 1.50 "
Nylon 600 NCC-04S2520-NYR 1.85 "
Nylon Glass-filled 630 NCC-04S2520-NGFR 1.85 "
Hard Rubber 620 NCC-04S320-HRS 1.65 "
Nylon 640 NCC-04S320-NYR 1.95 "
Nylon Glass-filled 670 NCC-04S320-NGFR 1.95 "